This entry was posted in conspiracy, crime, fake hate crime, fake news, Hollywood liberals, LGBT, Liberals/Democrats/Left, Michelle Obama, Obama, race baiters/profiteers, United States and tagged Chicago police superintendent Eddie Johnson, Joseph Magats, Judge Steven Watkins, Jussie Smollett, Kim Foxx, Tina Tchen. Bookmark the permalink. Let’s look at this another way, what if it had been a trump supporter, who faked an attack by Antifa or one of the other left group, now would they get the same pass from a prosecutor? Ask yourself is there still justice in our court systems that are now nothing but political hacks left over from the last disgraceful administration. Such crap,and I truly feel for the Chicago police on this one. They worked hard for the truth, too bad they can’t enforce justice. Come on! Did anyone really expect this guy to answer? Well here ya’ go. “Big Mike” got involved with her friend, the State Attorney. The left is totally lawless. They don’t even understand right vs wrong. This was always a problem but it became rancid under Obongo. We never had a more divisive President. These disgusting nihilists make a mockery of all we hold dear. Everything is about getting Whitey. Jussie’s supposed community service was volunteering at Jesse Jackass’ Rainbow PUSH this past weekend. Jussie “serviced” the community by going on the down low. And just when is Rainbow PUSH going to be audited? It’s hardly a non-profit – Jesse profits quite well. The token States’ Attorney Kim Foxx & Jussie Smollett deserve something truly horrible to happen to them for this travesty of justice, along with Tina Tchen, Moochelle Obama’s former CoS who started this ball rolling. One thing I think’s gonna happen as a consequence, is the Chicago PD will start solving even fewer crimes, because now they think the State’s Attorney’s office will drop more cases like this – couple that with the police reforms that Rahm Emanuel signed up for with the Obama DoJ, and crime in general will get even worse. To put it simply, this is “payback” for Chicago PD officer Jason Van Dyke’s relatively light sentence in gunning down a doped-up Laquan McDonald a few years back. That incident is ultimately what led Kim Foxx into running for State’s Attorney. I just wonder if they dropped the charges on the two black “white supremists”also, just to be fair. As the saying goes “is not who you know but who you ……! The community united, that is Michael and Barack’O and company, Jessie Jackson, the Rainbow Coalition Master, have hooked a low blow to JUSTICE. Juicy has a sealed record but EVERYBODY know he has an indelible past, present and no future. As in many cases, this will be a burden to Juicy, so he better be strong or PTSD will claim what’s left of him. This is how the Obongo’s and their “friends” repay Whitey. Whitey deserves it for daring to take on this poor oppressed black millionaire. We shouldn’t lose track of the timing of this. The lesson: we ALL need to save up $10,000 in a “rainy day fund” so that, if the need arises, we can “buy ourselves off” from any State or Federal charges. And then….we can all go on to a film/TV career as tho’ nothing had ever happened on our part……..Life is Great here in the USA! Now he and his lawyer are claiming that his black assailants wore “whiteface”. Yesterday Foxx claimed that he would have been convicted if he went to trial so she had to do something. Barry and Mike are up to their slimy necks in this. 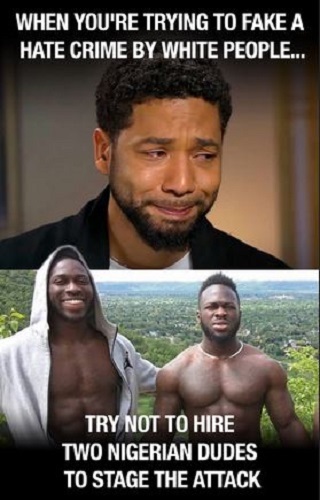 This mutt should change his name to “Jussie Chutzpah”. What an A-hole. It figures that he’s a friend of Mike and Barry’s. This little weasel smirks too much for my taste. Nowhere have I seen the possibility put forward that this is a new kind of false flag. Has all the markings and lo and behold they let the scumbag go. Either that or his hoax turned into a shakedown.